When heavy rains strike, help always pours out to communities affected by the floods, but seldom reported are those who are not sinking in flood waters yet are stranded in their own houses with no food or water. Being trapped in the mountains without food could be inconceivable for many of us, but the 7,000 families in the mountain part of San Rafael, Rodriguez, Rizal, experienced this condition when the southwest monsoon and typhoon Maring struck the area. When the Wawa River overflowed, they were trapped in their own homes, and the floodwaters in the nearest municipality hindered them from getting into town to get food supply. Landslides also washed away houses along the mountain slopes. Around 7,000 families reside in the mountain area beginning from this side of the river and far beyond. This unfortunate situation is an opportunity to help, which Barangay Cherry Mobile grabbed as soon as news of their condition reached the management. Cherry Mobile employees purchased relief goods and started packing in no time, with representatives from different departments working together to repack sacks of rice and canned goods into Cherry Mobile bayong bags. With the help of Lieutenant Primo Partosa of the Rizal district and the Philippine Marines Fifth Infantry Brigade, the community basketball court was turned into a distribution center. Officers of the Philippine National Police also came to enforce security in the venue. 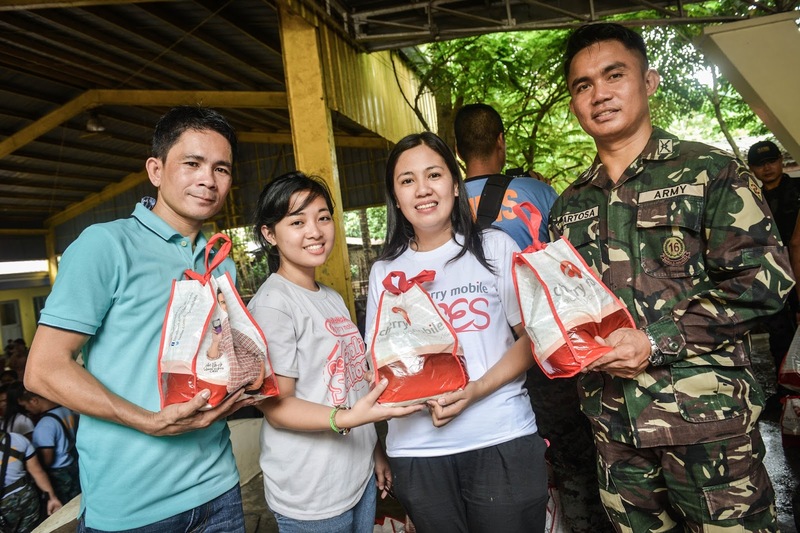 Barangay Captain Edgardo Sison hold relief packs for distribution with the Cherry Mobile CSR team and Lt. Primo Partosa. Residents came from up the Sierra Madre mountains and had to walk two hours to reach the covered court for the relief goods distribution. Adults and children alike composed the 1,000 families who gathered and waited patiently for the aid. 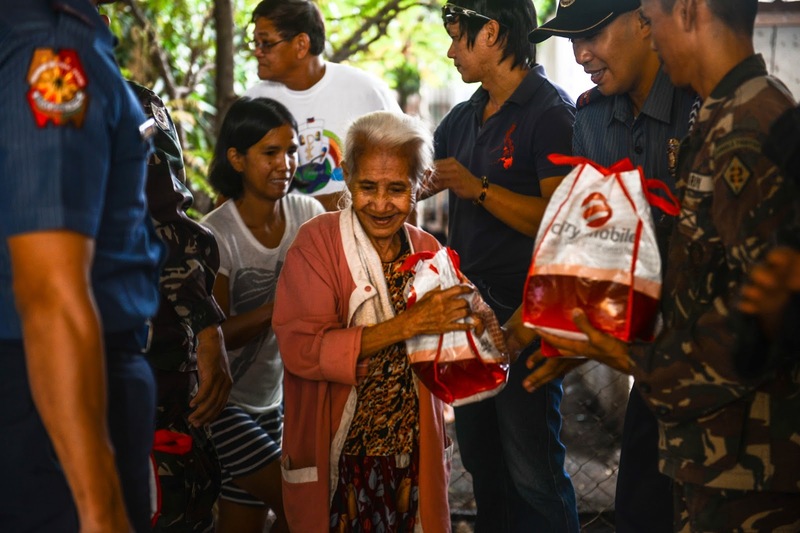 After a round of messages of encouragement from Cherry Mobile, the AFP, and local barangay officials, the long lines moved as one by one the beneficiaries received their relief packs. After the distribution, the mountain residents, tired but contented to be secure with food for the next few days, left for their two-hour journey back home. Barangay Cherry Mobile also travelled to Noveleta, Cavite, to help 1,000 families in one barangay affected by the flood. This relief operation materialized with the help of barangay councillor Kate Bernal. Beneficiaries from within the community gathered one Saturday morning to welcome a truck of relief goods sent by Cherry Mobile to their aid. It is the main goal of Barangay Cherry Mobile to respond to the needs of the communities by delivering help not just for the sake of doing so, but to really make sure that the support reaches those who need it. For this reason, volunteers from Cherry Mobile take time to travel to far locations where majority of the outpouring donations do not reach. By doing so, these volunteers do not just make sure the supplies reach the target beneficiaries but also show compassion personally by means of gestures of kindness.